I tried looking up quotes about kindness and couldn't find anything to express what I felt today when I got back to work from vacation. Most of what I found had to do about being the giver and not the recipient of such acts. 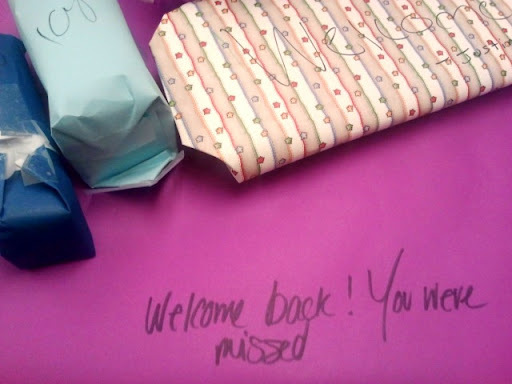 And I guess it makes sense, how can one articulate what it feels like to walk into your office, dreading the pile of work that has mounted in your absence, only to find your desk all wrapped up (with a big bow!) by the (middle school!) children in your program? 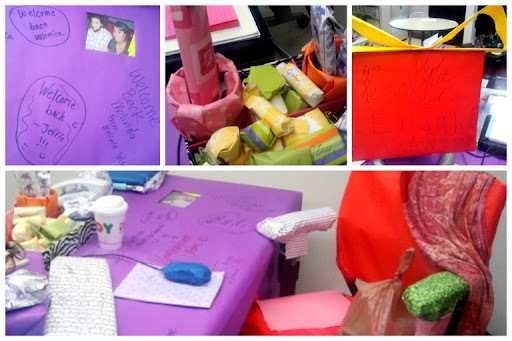 Not only is the desk wrapped, but your pens, Post-It's, computer, mouse and its pad, chair, stamps, and lots of other crap are covered in pretty paper. And the finishing touch? They made sure to cut out a slot in the paper so you can still see that picture of your cousin. And there it is, even in a little prank by the most mischievous children, you find that part of them that is pure, empathetic, and most importantly: kind. It will be all you ever hoped for in the children with whom you work. I won't take credit for this act, but I can't say that I won't savor it as one of the best moments in my career. So much of our news today centers on the meanness and bullying by the youngest members of our society, and so often, what we leave out is all of the good in them. This is just the sweetest, the fact that a little piece was cut out for the photo of your cousin made me get that pesty little lump in my throat! Love. a different page аnd thought ӏ mіght as ωell check things οut. I like ωhаt I see so i am juѕt following you. Look forwaгԁ to exploгing уour web page гepеаtedly.